stayed here 22sept for 1wk hb ,rooms are small.not enough space to put your clothes ,wardrobe has only 8 coat hangers meals are ok ,breakfast is the same every morning ..deserts at lunch are really nice .chips @roast potatoes were always just warm.the plates were dirty @chiped cups dirty inside.as were the knifes @forks.this hotel is in the old town of salou.with not much to do ,the new york pub over the road is not bad for cheap beer,its a 40min walk into saluo ,some people say its only 25 min ,believe me its not ,or you can get a bus for 1.35 euro each or a taxi is 8euros.all in all it does what it says on the tin ,would we come back to this hotel NO? 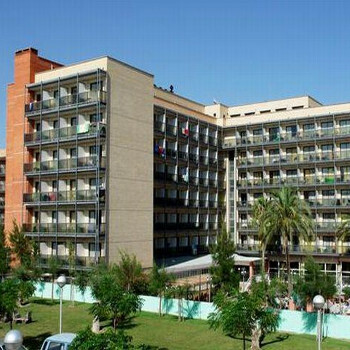 My family and I enjoyed our stay at the Eurosalou Hotel. It's not your typical 'Home from Home' hotel, but if you come to Spain you should expect to meet Spanish people and learn a bit about the culture and language. Don't expect the Spaniards to all speak English! The room was very small for 5 of us (2 adults, my partners teenage son, our 1 year old son and 7 year old daughter). However, it was clean, towels changed daily etc. The food was varied, all buffet style. We're fussy eaters but always found something we liked! The staff were generally pleasant enough. There was a mini club for kids, but it wasn't very good compared to previous kids clubs my daughter had been to with other tour companies. The Hotel Eurosalou is in the old town but it’s only a 20-30 min walk along the promenade to reach the livelier part of Salou. The location is ideal for the train station which is only 5 mins walk away. From there you can travel to Port Aventura, Tarrogana or Barcelona. There was entertainment every night. Some nights were more enjoyable than others, but it depends what you like. The drinks from the bar and poolside bar were quite expensive. Cheaper to stock up with cans from the local supermarkets. There's plenty of little shops and cafes in the nearby vicinity. Yes, I would visit this hotel again. However, if you want 'Britain in the sun', then best to avoid it. Overall, I think the hotel and deal we got was fairly good value for money. Before arriving at the Eurosalou I had read a few reviews, and to be honest they weren't that great. I started to dread the holiday before arriving. On arrival at the Eurosalou I was very impressed, the lobby area was very clean and tidy and we did not have to wait too long for our rooms. On receipt of the keys I again began to dread the state of the rooms but these again were fine. Yes they are quite small but our holiday would not be spent in the hotel rooms but spent exploring the area. Four of us (2 adults, 2 children) stayed in these rooms but to be honest they are more comfortable for three persons but it can be done. Our room looked over the back of the hotel which over saw the pool and the evening entertainment area, this was great for us as the children were able to watch shows from the hotel room before going to bed. The pool isn't that big but we all had fun, there is water aerobics every morning, and we mingled with the other visitors as many are from the UK. We also played water volley ball children against adults which got everybody involved. The food was great, a different dish every day. There were different themed nights and different meats on offer. Everybody we spoke to enjoyed the food and had no complaints. The reception staff spoke little English but you are able to have a conversation with them, but to be honest if you are going to Spain why not learn to speak the language before going there. The late night entertainment is great for the children and adults as there is a mixture for everybody. We saw a Spanish themed dance one night, live Spanish singer another night and a spider man show another night. I would definitely say that this is a great 3* hotel, but if you are looking for 5* pay the price as I have no complaints regarding this holiday at all. We all had a lovely holiday and will definitely go back again. First impressions of the hotel reception was nice and clean. The have two lifts for a 7 floor building. The restaurant had been renovated. The food was OK, although sometimes you got left overs from dinner as breakfast which was bad. They didn't serve tea just coffee and juice. Dinner was nice as you got variety of meat and fish dishes. You were not allowed to bring drinks from the bar to the restaurant, and the staff didn't always attend to you to ask whether you wanted a drink, so you eat your dinner with no drink. This is so that you paid more for your drink at the restaurant. The bedrooms were cleaned every day, but the bed sheets were not changed which we found was not good. Their entertainment for kids was appalling, not very much for them. You need to stay there if you have plans to visit the resort or visit other areas. my first impression i thought the hotel wasnt bad. it had a nice clean spacious reception, and although the rooms sizes could be compared to a shoe box they seemed clean. that is the only good thing i have to say about the place. i thought the food was vile, the same food every day with flies always on the pasta! they even watered down th orange juice. i ended up going down town and paying extra for food. location wise the hotel was ok, there was a 20 min walk to the lively area, and about 10 min to the beach, either that or 6 euros for a cab (unless that they spot ur a tourist and decide to charge 10 euros!). the worst part of the hotel was the staff, they would look down on everyone who wasnt spanish. we would always be last to be served at the bar and at the dinning room where sometimes they didnt serve us at all. everyday at 11 am music would be blasting till siesta time, before contening till the early houres. the worst part of the holiday though was having spaniards looking in to my room constantly, and following me about, knocking at my door! they were even phoning my room which was quite scary. Eurosalou. This hotel looked ok on first impressions but as the first few days went on i found out that this hotel was not very good. First of all all the bar staff were ignorant towards you then most the entertainment was catered for Spanish people( Spanish music dancing etc). Then you had the food which was mostley cold and reaped itself every second or third day so you get a bit bored with it. The location is about a half an hour walk to the centre so hope you like walking or paying for taxis which cost about five euros. On the plus side it was clean, rooms cleaned and fresh towels every day. Stayed in Eurosalou hotel with a school trip. First impressions was worth the money but, the rooms were small even though I didn't mind too much. The food was downhill, the same food everyday and windows rattled at our table. From the balcony there was a building site, noisy at siesta times and loud music till late at night. Irish and spanish knocking on the doors and pointing pellet guns to our heads and climbing our balconies. I also felt that the rooms weren't clean, didn't have clean towls or toilet paper. The staff weren't that nice,taking drinks that we bought from bar away and food. I thought it was like a boot camp by the way we were treated. I was happy to get away! I went on school trip here.The hotel seems nice enough from the outside and has qite a nice reception area.When we saw our room we were quite pleased to notice how clean it seemed.The next day we realised the staff weren't as friendly as we thought because the reception staff gaves us dodgy looks all the time and even had some arguments with some of our school staff.There is one member of staff at the hotel who was reslly weird and almost stalked me and my friend for the whole three days.He followed us up the lift one day and followed us to our hotel room and stood outside the room waiting for us to open the door.He then continued to stand there while we went in and shut the door, it was after that when i went onto the balcony and saw him standing across from me staring in from one of the hotel windows.If this wasn't strange enough, i'll tell you what happenened the next day.I went to the theme park and came back to find out on the balcony a pile of clothes neatly folded on one of our chairs (they were size 24 and certainly not mine).The hotel said they must have blown down from the balcony above (what and folded themselves aswell,very likely). The hotel food was usually cold and very little selection.A lot of spanish people tend to stay in the hotel and don't seem to welcome scottish very much because i got pushed out of the queue for my food and then shouted at in spanish for picking up a plate to put my food on.This was the stangest hotel I've ever stayed in.